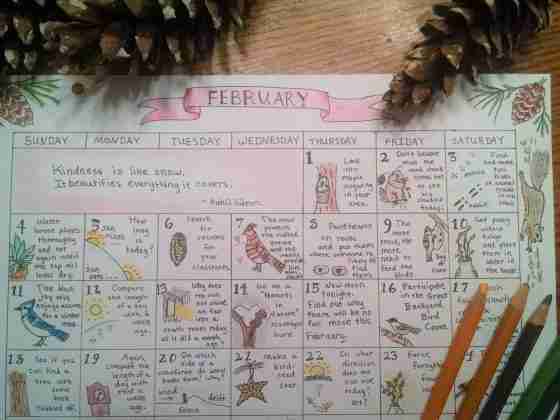 Here is a February: Nature Day by Day Calendar for you. I had a lot of fun finding nature activities to put on there and we’ve already enjoyed doing some of them. I find that if you embrace the season you are in, you will spend less time wishing for the next one. Here are some links where you can read more about some of the activities. If you post on Instagram with the hashtag #naturedaybyday we can follow along on each others’ journey. Don’t feel like you have to do each activity on the day listed. Just do what works with the time and weather you have. 1. Look into Maple Sugaring in your area. Scroll to the bottom of the above post for some great picture books on maple sugaring to read together. 8. 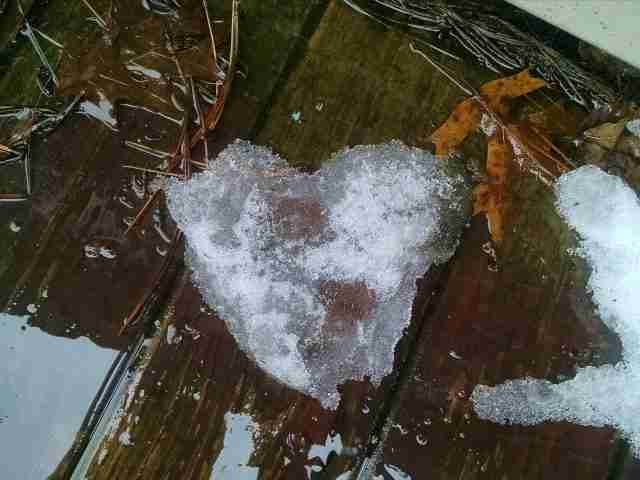 Paint hearts on rocks and put them where someone is likely to find them. 9. There are many different ways to make a suet feeder. 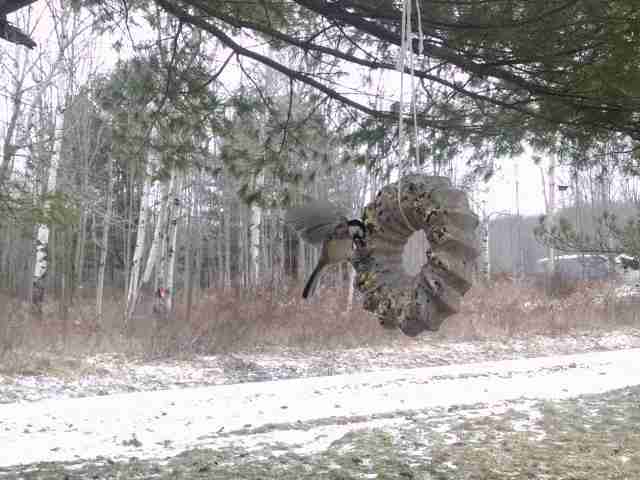 You can make a wreath shaped suet feeder. I really recommend this one! Or fill large pine cones with the mixture. 12. You could also try photographing the snowflakes. Read Snowflake Bentley for inspiration. 14. 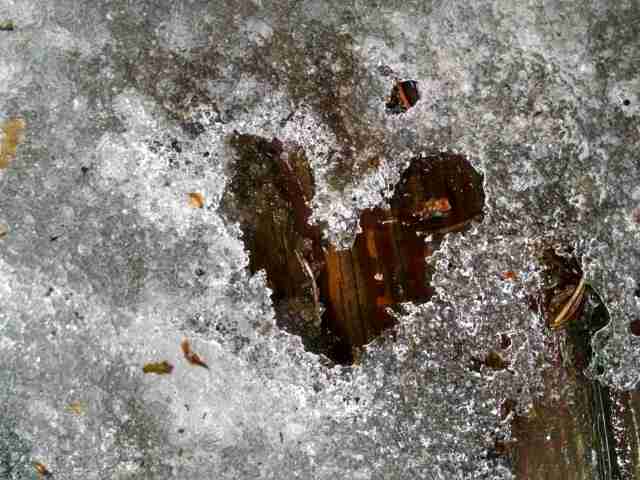 Go on a “Hearts in Nature” scavenger hunt. This really makes you stop and pay attention to detail. Take some photos. It would be great if you would post on Facebook or Instagram with the hashtag #heartsinnature2018 so we can follow along with each other. 16. Participate in the Great Backyard Bird Count. I’m really excited about this and hope to do this with my children this year. 21. Make a birdseed star. Instructions are found at number 4 on this list. 23. Bring forsythia branches inside and force them to bloom early. You can read this article. But again, it’s pretty self-explanatory. 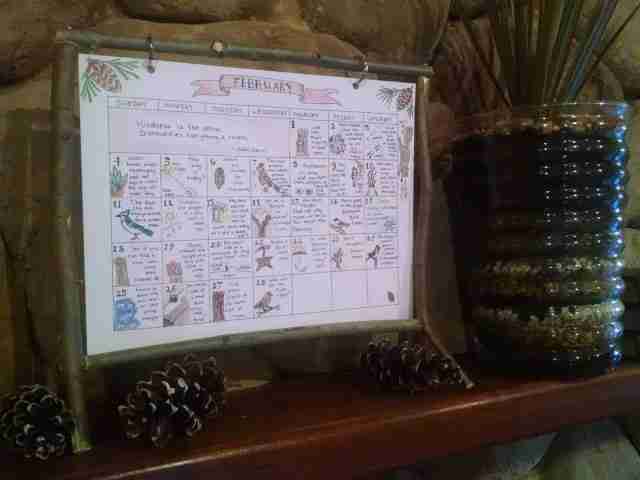 My inspiration for this calendar came from the book Natural Science Through the Seasons: 100 Teaching Units by J.A. Partridge. what a gorgeous calendar! You are very talented and what a beautiful way to focus on nature each day. Thank you. I don’t feel talented– just persistent. I’m enjoying learning, though, while working on these calendars. Looking forward to March’s calendar.